For those of you that think that the US manned space program is on its way out, I have news for you! 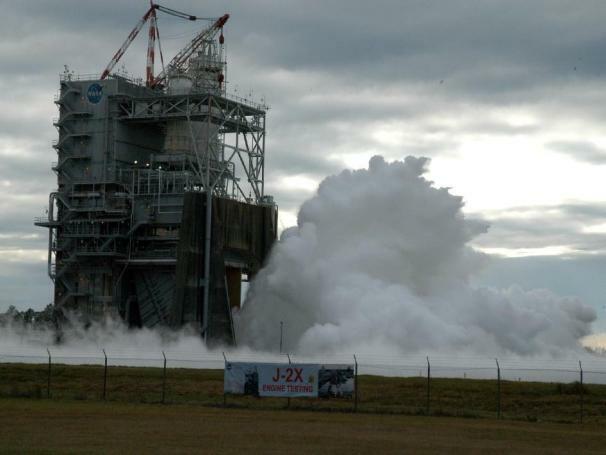 NASA recently conducted a successful 499.97-second firing of its J-2X rocket engine, the successor to the J-2 and the J-2S, on November 9, 2011. This is just one thing of the many missions that NASA has planned for the future. The 500-second (give or take a few hundreths of a second) test firing (see below for the video) marked another step in in the development of NASA's heavy-lift Space Launch System (SLS) which is expected to replace the Space Shuttle following the cancellation of the over-budget and problematic Constellation Program. The J-2X could be used as the second-stage engine for the SLS, which will be capable of carrying both unmanned and manned trips around the moon. It's the same heavy launch vehicle that will carry the manned Multi-Purpose Crew Vehicle (MPCV) on deep-space missions that will last up to 21 days. According to NASA the SLS will be safe, affordable, and sustainable. In addition to testing the J-2X, NASA plans to flight-test the Orion spacecraft--made by Lockheed Martin Space Systems--in 2014. Orion was originally a part of the now-cancelled Constellation Program, but NASA retooled its development to fit the SLS, and as part of the SLS it will fly on the J-2X. According to NASA, the 2014 flight will be unmanned, will fly two orbits high above the Earth, and it will make a water landing. The J-2X itself is a rocket engine capable of 294,490 pounds-force (lbf) of thrust that uses liquid oxygen and liquid hydrogen fuel (LOX and LH2). The J-2X comes via Pratt & Whitney Rockedyne, a rocket engine designer and manufacturer. The original J-2 motor was used on the Saturn V and the Saturn 1B rockets which are famous for the Apollo program and Skylab. According to Mike Kynard, Space Launch System Engines Element Manager at NASA's Marshall Space Flight Center in Huntsville, Alabama, the J-2X engine team and the SLS program are extremely happy that the test was safe and successful, and that "this engine test firing gives us critical data to move forward in the engine's development." In time, this rocket engine will carry man back into space on long deep space missions.